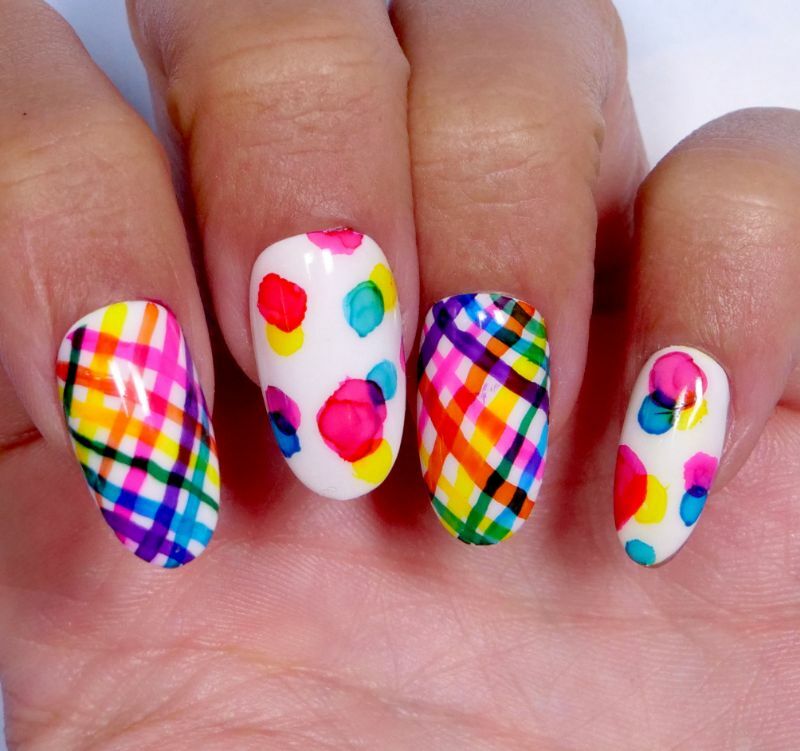 Fabric-inspired nail designs continue to trend, and this gingham design makes a stunning change of pace for spring. Traditionally, gingham is a tone-on-tone fabric, but this manicure uses a white backdrop to make the most of six different alcohol ink shades. If you can paint a straight line, then you're up to the task of painting gingham. Start by drawing two intersecting diagonal lines in magenta, then add additional pairs of orange, yellow, green, blue and purple. Alcohol inks are translucent and very thin, so there won't be any texture to worry about, even when layering six different shades. 2. Apply one coat of matte no-wipe gel top coat to the nails, then cure it with the lamp. 3. Pour isopropyl alcohol into a glass dish. 4. Create a paint palette by placing one drop of each colored ink onto a clean glass plate. 5. Dip the fine detail brush into the alcohol, then dip the brush tip into the magenta ink. Draw a diagonal line from the cuticle to the nail tip, then draw an intersecting line going the opposite direction. Clean the brush on a paper towel. Repeat with each individual color. 6. When the design is complete, cure the ink briefly with the lamp. 7. Seal the finished design by applying a layer of no-wipe gel top coat, then cure it with the lamp. Treat yourself to some sunny outdoor activities, and show off your gingham-inspired manicure. Stay pretty, and please share this nail tutorial on Facebook!